Do You Need To Have Auto Insurance In New York? The United States has all types of laws, rules, and regulations. Some laws are federal and some laws on handled on the local, state level. Auto insurance laws are one of these things that are managed on a state-by-state basis. New York, just like every other state in the country, has its own auto insurance minimums and requirements. Do New Yorkers Need Auto Insurance? To answer the question “do you need auto insurance to drive in New York?” the short answer is “Yes, you do.” Just how much coverage you actually need and how much the state requires are the tricky questions. According to the New York State Department of Motor Vehicles website, all cars registered in the state of New York need liability insurance. This liability insurance must be equipped with minimum limits of $25,000/50,000 for injury coverage, $50,000/100,000 for death coverage, and $10,000 for property damage coverage. Keep in mind that these are just the minimum requirements. You should always make sure that you would be financially secure in the event of an accident. This may mean that you need to purchase more than the state required minimums. 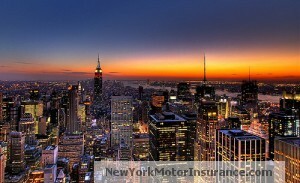 NewYorkMotorInsurance.com always recommends more than the minimum required by law. Full coverage insurance or other comprehensive policies do not always need to be expensive. We can help you find an expensive policy with the coverage you need. Like stated above, if you drive a vehicle on the public roads and highways in the state of New York, you must have proper car insurance. Even if you drive a car registered out of state, it must always satisfy the state required laws set forth by the New York government. Meeting these requirements not only protects yourself financially, it will also ensure that in the event of an accident, the other party will be covered. To buy car insurance in New York State, you need to connect with an insurance company that is authorized to do business in New York. The company who issues you your policy must be licensed by the New York State Insurance Department. Educate yourself more about car insurance in the state of New York by reading the articles and blog posts on our site. After learning more about the laws and requirements in the state, read our guide on the types of car insurance coverage you are able to purchase in the state. Some coverage types make sense for some people and do not make sense for others. Once you are ready to purchase car insurance, let New York Motor Insurance help you find great rates. We give New Yorkers options to save. If you would like to work offline with an insurance agent or broker, visit our agent directory to find a local agent in your area. If you enjoy the convenience of making purchases online, we also give you that option. Scroll up to the top of this page and enter your New York zip code to start comparing rates in your area. Whether you live in Brooklyn, Buffalo, or Binghamton, we will help you compare rates from multiple car insurance companies in your area to help you find a custom insurance plan at a rate you can afford.